OK, fine… The Longines Asthmometer-Pulsometer Chronograph is really just a chronograph with a fancy scale painted on the dial. But, it’s a pretty chronograph with a fancy scale painted on the dial. Longines says their new Asthmometer-Pulsometer Chronograph is “elegance in the service of science,” and I’d have to agree. The watch is truly lovely and elegant even if it is strikingly similar to the Girard-Perregaux 1966 Chronograph Doctor’s Watch. How does it work? Well, the red heart rate scale and blue respiration scale (get it, red = heart, blue = air) ring the outer edge of the silver dial. Just add the number indicated by the second hand to the first thirty counted beats, and, presto, you have a heart rate. Calibrated for five breaths, the chronograph’s second hand is stopped after the patients fifth breath. The indicated number is the number of respirations per minute. Cool, huh? 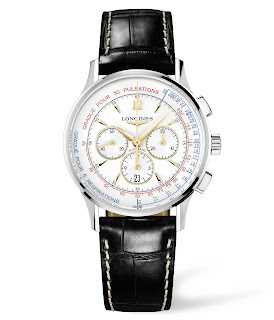 The Longines Asthmometer-Pulsometer Chronograph is powered by a Calibre L652.2 (ETA 2094) 33 jewel movement with 28,800 vibrations per hour housed in a 38.5 mm steel case on a black alligator strap. 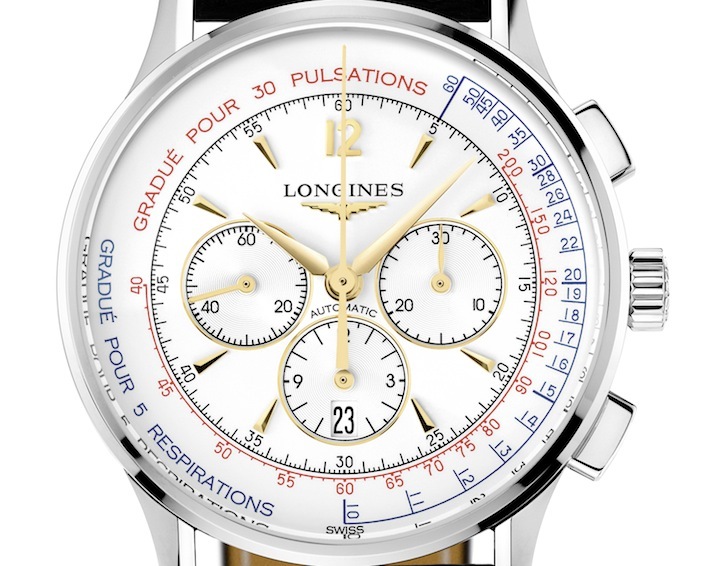 No word yet on price, but the full technical specifications are below as is Longines’ press blast. 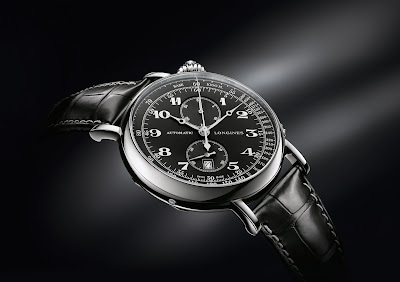 The Swiss watch brand Longines, founded in 1832 in St. Imier, is particularly well known for the elegance of its products. The Longines Asthmometer-Pulsometer Chronograph is no exception to the rule and has the advantage of providing medical information as well as being a fine-looking timepiece. The Longines Asthmometer-Pulsometer Chronograph demonstrates the fact that the precision of a chronograph is necessary not only in sport. This new instrument is based on a model brought out in 1963 which was intended essentially for medical use. The new product not only shows the time but also measures heart rate and respiration. While the pulse and respiration scales can be extremely useful in a sports context, during training sessions for example, they also provide a doctor with valuable information as to the patient’s vital functions. 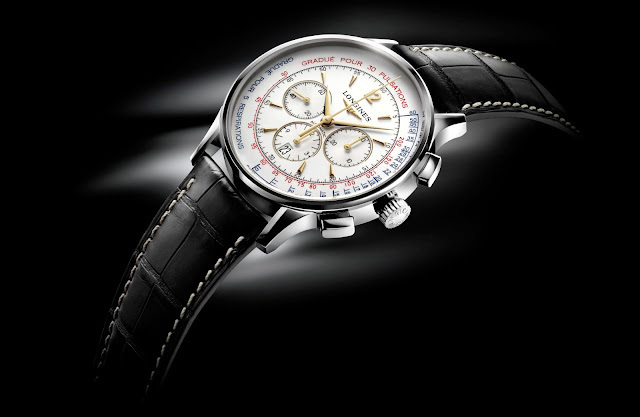 The Longines Asthmometer-Pulsometer Chronograph is thus a healthcare instrument in the broadest sense but at the same time a milestone in the brand’s history. The original model dates from a period when diagnosis could depend very much on the precision of the instruments used. 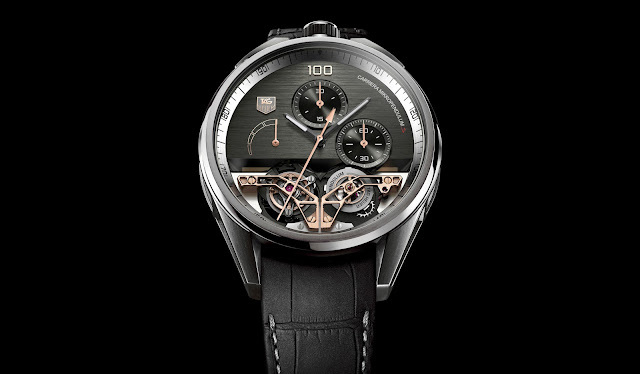 The polyvalence of this new chronograph is evidenced by the noticeable beauty of its design, different colours being used for its various purposes. As a medical instrument, the Longines Asthmometer-Pulsometer Chronograph echoes the principal design features of the product on which it is based. The red heart rate scale and the blue respiration scale can be easily read off from the outer edge of the silvered dial. The 12 numeral and the eight gilded applied indices blend perfectly with the hands and the counter circles, which are also gold-plated. 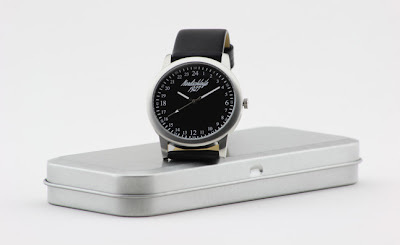 The steel case, which has a diameter of 38.50 mm like the original model, is enhanced by the bevelling of the horns. The black alligator strap adds the final touch of sleek elegance to this doctor’s watch.